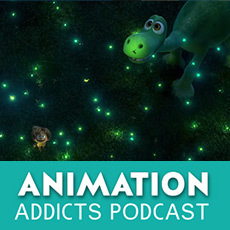 In episode 109 of the Animation Addicts Podcast, the Rotoscopers review Pixar’s second feature to be released in 2015, The Good Dinosaur. Mini discussion about our thoughts on the new short Sanjay’s Super Team. The film’s troubled production history. To understand the film, you need to understand this. Best parts of the film in our opinion: T-Rexes, Arlo and Spot’s relationship.